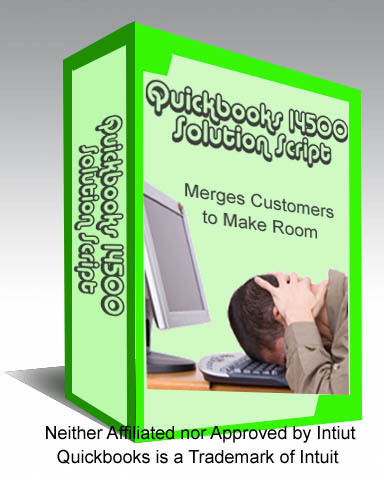 Quickbooks 14500 Solution will allow you to continue using Quickbooks after the 14,500 limit has been reached. It Works with Quickbooks version 2006 - current. Quickbooks 14500 Script Merges comes in 3 different versions: Customer (C), Vendor(V) and Items(I). The Customer version will merge customer accounts to solve the Quickbooks 14500 limitation. The Vendor version merges vendor information, and the Item version will merge item lists. Customer version merges customer accounts. Vendor version merges vendor information.